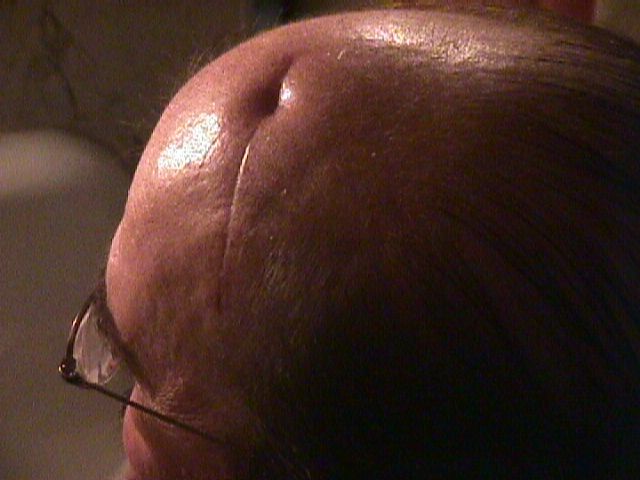 Having suffered life threatening acute disseminating encephalomyelitis (ADEM)-- Steve Schoner's brain biopsy scar shortly after his one month stay in the hospital. 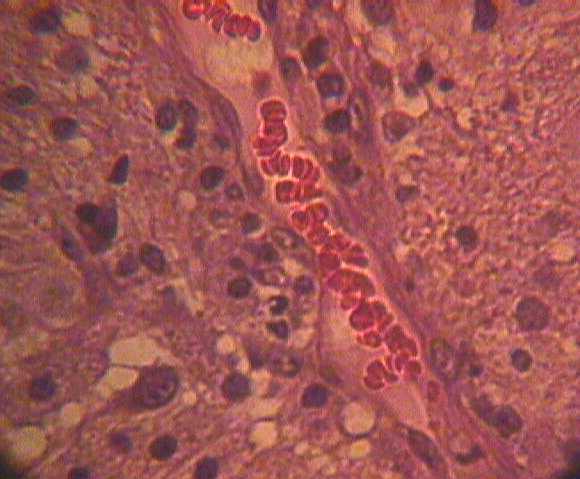 The purpose of this page is to present not only these remarkable biopsy slides taken from my brain, but to provide information links about this very rare disorder that is related to other demyelinating conditions, such as MS, Transverse Myelitis, as well as a diverse range of abnormal demyelination conditions. My Unitron Metallographic BU-11 microscope used to take the images of slides. 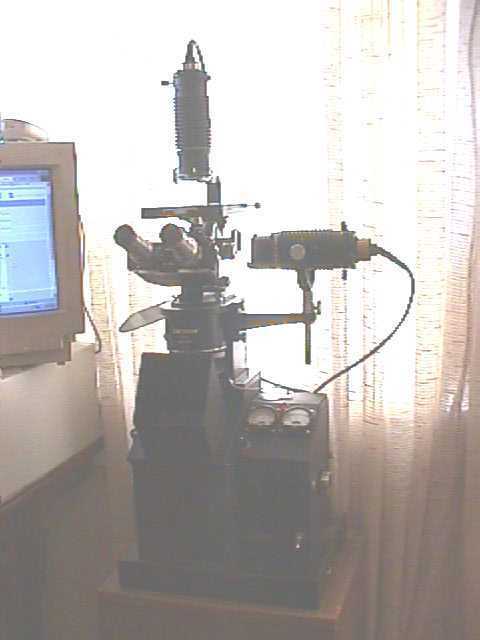 This microscope can be used to examine metals such as in meteorites, and for petrologic studies for which I use it most. 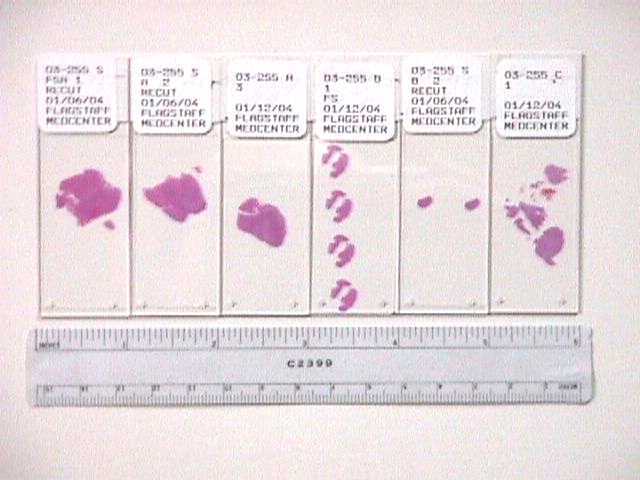 However, I have found that it also works very admirably, even with my limited experience with histology slides as with the following slides clearly show. 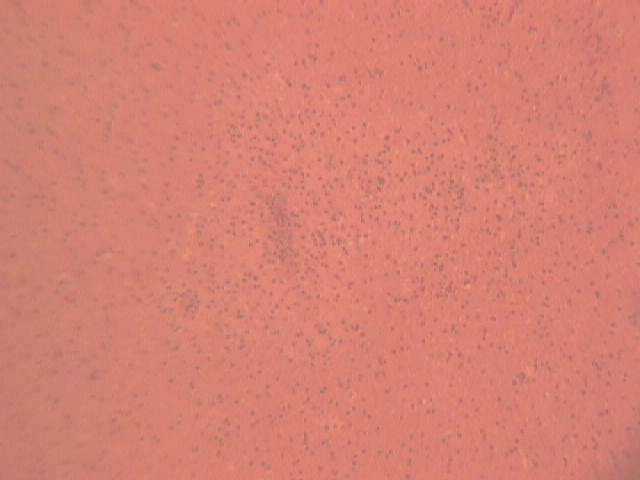 The following images were taken with my personal equipment, and the interpretations of what is seen in these slides are not contingent or relating to the official Pathology report, those of FMC, and or the neurosurgeons involved. And at this point in my recovery, I do not make any claims that my observatons are medically accurate, other than to say that they appear to relate to the information I gleaned in the resources listed at the end of this page. I will, however update this page once I can review the 76 page official Anatomic Pathology Report that pertains to these slides, and what they reveal. 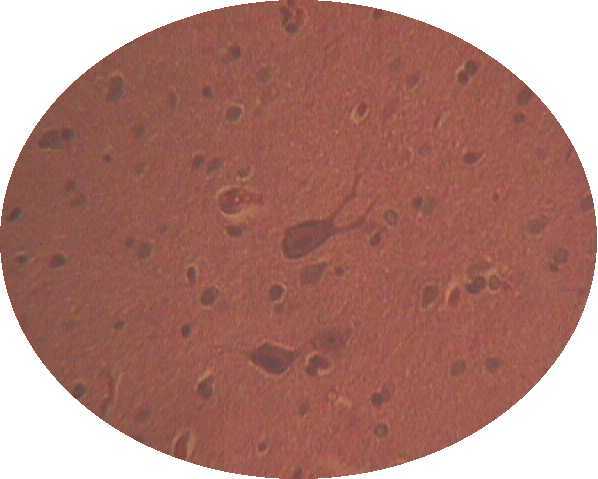 Brain section (A-2) showing white and gray matter. The largest dimension of this section is 3/4" (2 cm). 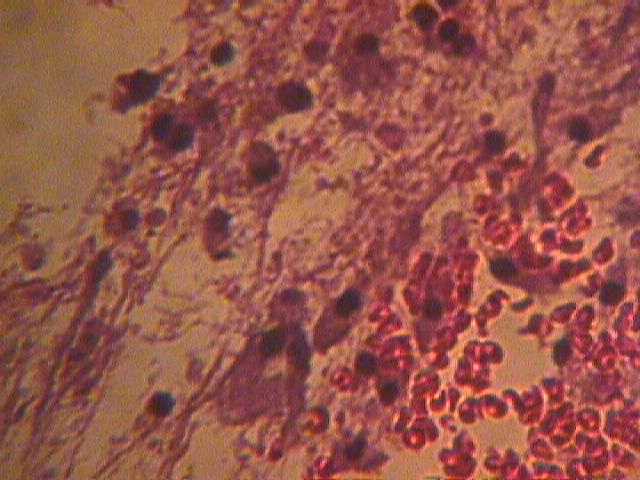 There are several areas surrounding minor hemorrhages, showing as dark areas that are shaded lighter than the surrounding tissue. 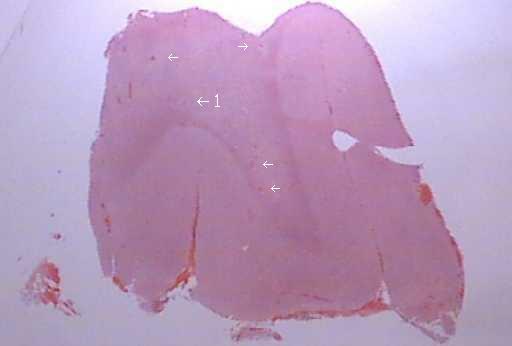 Arrows point to areas where demyelination has occurred. A very nice 500X photo of a branching Purkinje cell and neuron below it in affected white matter. This incredible 300X image is of a spiral blood vessel with red blood cells within. 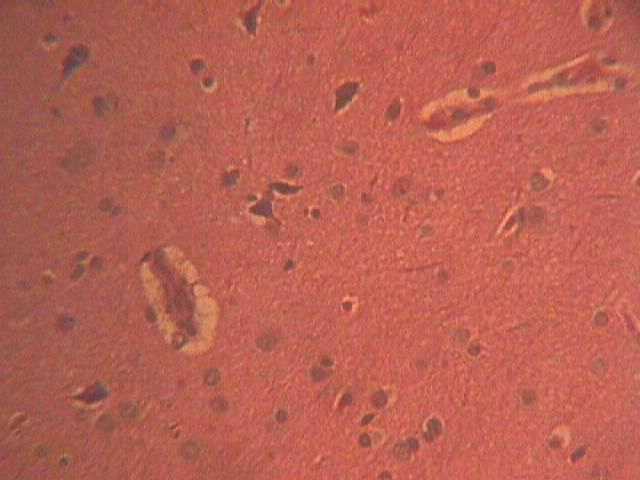 The white areas are macrophage cells, and these have permiated the vessel walls penetrating white matter causing demyelination. The actual size of this view is > .1 mm. 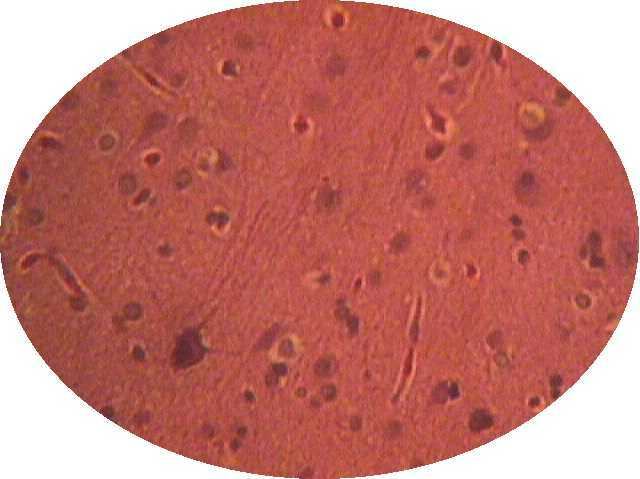 I would like to extend my appreciation to members of the Flagstaff Medical Center Pathology Department for preparing and presenting to me these re-cuts from original tissue extracted from my brain on January 10th of 2003. The biopsy report described this as a "large brain biopsy" done when I was in a coma from this debilitating and nearly fatal condition. They did not expect me to survive. But, thank God I did, and am on the road to recovery. Needless to say, there are however certain disabilities that remain, and in light of this my former vocation as a computer technician is in question. 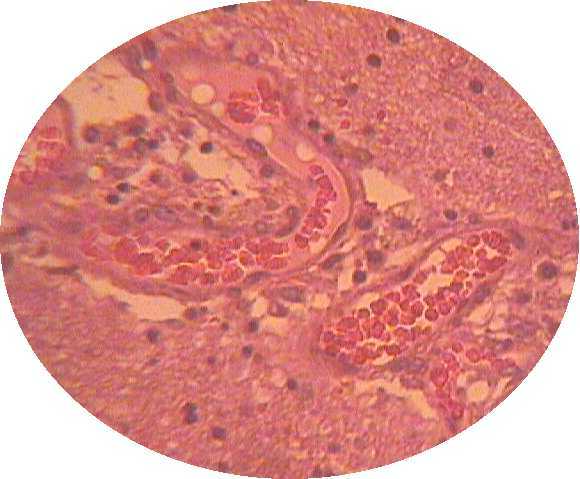 But these slides have sparked my mind to study this rare condition, at least in thought and personal interest. That I survived this condition is a miracle, and in my current state of mind, looking at my own brain, to see and comprehend the things that I am seeing is awesome and inspiring-- Even more I think than I would feel if in space, or standing on the moon. 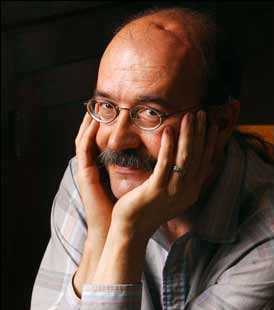 Someday, perhaps I will write in layman's terms a story detailing this experience and what is currently known about this strange and rare disease. But for now I invite you to search the links that I have found.